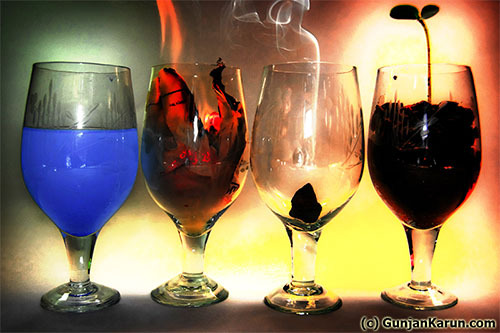 Water, fire, air, and earth. Creative Commons Attribution image by Gunjan Karun. At one point, we were comfortable describing our world as a being made up of various mixtures of four different elements: earth, air, fire, and water. Then along came chemistry, and we found that there were more like a hundred different elements, substances which were basic and fundamental, and could not be transformed from one into another: iron, copper, lead, gold, sulphur, carbon, oxygen, and so on. Our world had been transformed from relative simplicity to relative complexity. But then we discovered the secret of radioactivity, and it led us to the fact that the atoms we had thought were indivisible were actually made of smaller particles: electrons, protons, and neutrons. In fact, every atom of every one of the hundred-odd elements was made of just these three particles, arranged in different quantities and ratios. The constituents of reality had become simple again, but in a way that the Ancient Greeks could never have imagined. But then the methods we used to learn more about protons and neutrons and electrons started to reveal other sorts of particles: muons, neutrinos, W bosons, π (pi) mesons (also called pions), K mesons (or kaons), swarms of other different sorts of mesons and baryons. We were back to complexity again. I haven't discussed all of these different particles before, so let me take a single step backwards at this point. The invention of cloud chambers, particle accelerators, scintillation detectors and various other bits of equipment that let us examine particle interactions led to unforeseen discoveries. Nobody can predict everything that will be discovered when we find new ways to observe nature, and so it was with the tools we developed to understand subatomic particles. These detectors and the physics of collisions allowed us to determine the masses, electric charges, and angular momenta of the particles involved in various reactions. 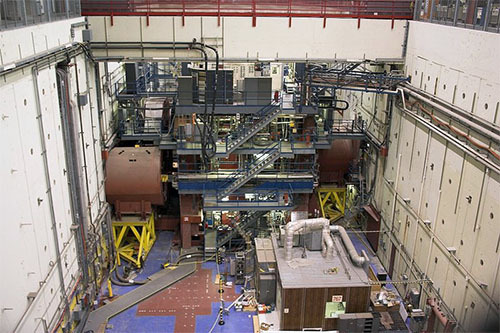 Stanford Linear Accelerator, a big machine to probe small particles. Creative Commons Attribution-Share Alike image by Justin Lebar from Wikimedia Commons. To better understand these new particles and their interactions, particle physicists looked for properties which governed their interactions. As an earlier example, whichever as maintained in all new reactions, total electric charge was conserved before and after any reaction. One thing they discovered was that the total number of baryons in any reaction is conserved, counting anti-baryons as minus one baryon each. So baryons are assigned a baryon number of +1 and anti-baryons a baryon number of -1. Mesons had a baryon number of 0, because they were not part of this conservation rule and could appear in unbalanced numbers before and after a reaction. An early new baryon was called the Λ (lambda) particle, discovered in 1950. It was electrically neutral like a neutron, and a little bit heavier than a neutron. It was unstable and decayed into either a neutron plus a neutral π meson, or a proton plus a negative π meson. This decay reaction fit with the theories of the time, except that the lifetime of the Λ particle before decaying was strangely long. The theory predicted the particle would decay after just 10-23 seconds, but instead it survived for 10-10 seconds. This might not sound like a big deal, with both of these times being much smaller than a second, but the magnitude difference is enormous. It would be like the theory saying something should happen in one second, but when measured it takes over 30,000 years. Then things got even more confusing. 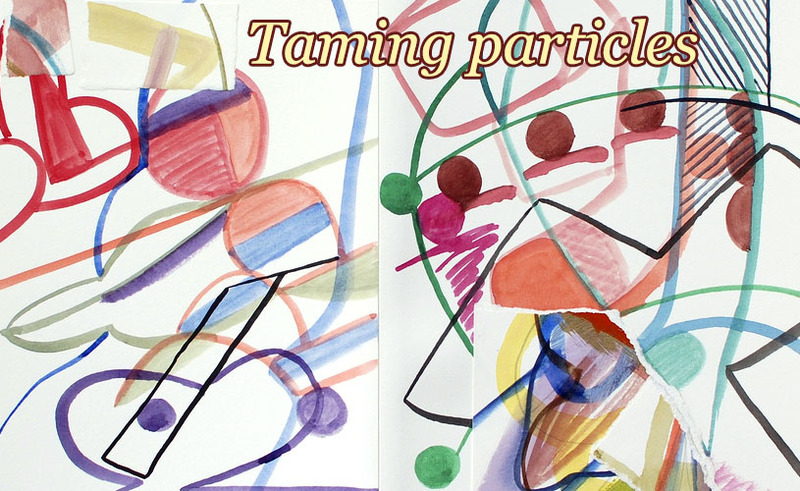 The new particles tended to fall into small groups with similar, but not identical properties. For example, there was a group of four baryons of almost identical mass, just a bit heavier than a proton or neutron, with identical spins of +3/2 (protons and neutrons in contrast have spin +1/2), but with different electric charges. These were called Δ (delta) particles, and came in electric charge -1 (the same as an electron), 0 (like a neutron), +1 (like a proton), and +2 (remember that +2 electric charge on a single particle - that's weird). These Δ particles decayed in about 10-23 seconds into either a proton or a neutron, plus a π meson of appropriate electric charge to make the charges balance. Their short lifespans before decay were consistent with theoretical expectations. Particles tracks in a bubble chamber. Creative Commons Attribution-NonCommercial-Share Alike image by Lawrence Berkeley National Lab. Then there were the Σ (sigma) particles, which came in charges of -1, 0, and +1, but also came in both spin 1/2 and spin 3/2 varieties. The spin 3/2 Σs were considered to be so-called excited states of the spin 1/2 Σs. Each spin 3/2 Σ was unstable and rapidly decayed into one of the spin 1/2 Σ particles and a π meson of appropriate electric charge to balance the reaction. The Σs (like the Δs) were considered a family of similar particles, in the same way that the proton and neutron were very similar except for the difference in charge. The spin 1/2 Σ particles produced another bit of strangeness, though. They decayed into protons and neutrons, plus π mesons, but how they did so was decidedly odd. The neutral Σ decayed quickly (in about 10-20 seconds) into a Λ particle and a gamma ray which carried away the excess mass-energy. The negatively and positively charged Σs, however, showed the same anomalous slow decay as the Λ, taking 10-10 seconds to decay into a proton or neutron plus an appropriately charged π meson. So these charged Σ particles could decay only slowly into protons and neutrons, while the neutral Σ could decay rapidly into a Λ, but this Λ particle then required a slow decay down to a proton or neutron. This huge difference in decay times was puzzling. Electric charge was conserved, baryon number was conserved, there seemed to be no reason for this strange slow decay of the Σs and Λ into protons and neutrons. The next step in science after making observations that don't fit the current theory is to come up with some hypothesis to explain them. In this case, the idea was proposed that there was not just one physical mechanism by which baryon decay occurred, but two different mechanisms with different properties. One was the expected decay which happened quickly, the second was a new, slower type of decay which occurred when the first type of decay could not. The first mechanism was seen as "strong", and the second one as "weak". The strong interaction produced the normal decays, while the weak one produced the "strange" slow decays. The particles themselves could now be seen as either "normal" or "strange". Protons, neutrons, and Δ particles were normal, while the Λ and the Σs were strange. A normal particle could decay rapidly to a normal particle, or a strange particle could decay rapidly to another strange particle (a neutral Σ decaying to a Λ), but a strange particle decaying to a normal one could only decay slowly, via the weak mechanism. So the strange particles could be seen as having a property, like electric charge or baryon number, which is conserved in strong decays, but may change in weak decays. Protons, neutrons, and Δs have strangeness zero, while Σs and the Λ have strangeness -1 (it was chosen to be negative rather than positive for historical reasons, the sign doesn't really matter). 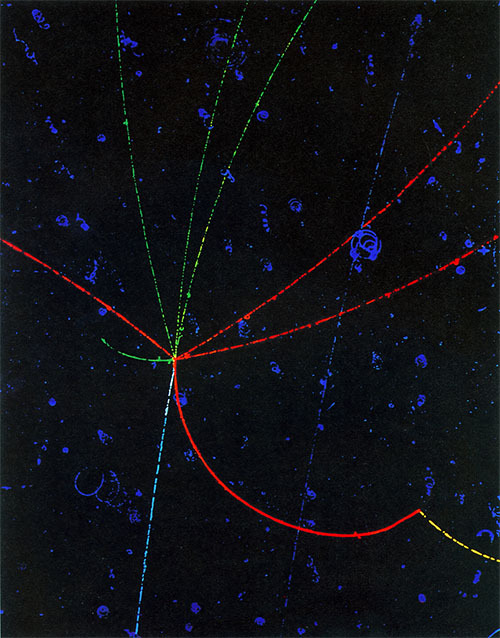 Additional evidence for this view of the interactions was the discovery of the Ξ (xi) particles. These form a family like the Σs, being slightly heavier baryons in two groups of two: spin 1/2 with charges 0 and -1, and spin 3/2 with charges 0 and -1. But unlike the Σs, there was no Ξ with charge +1. 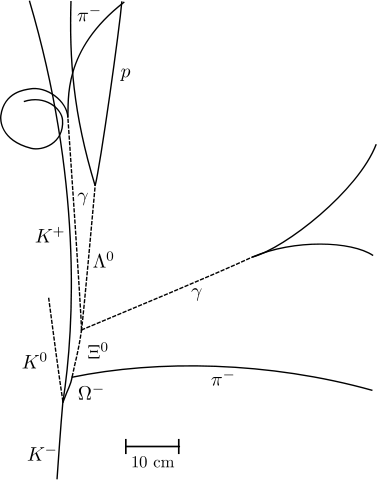 The spin 3/2 Ξs decay rapidly to the spin 1/2 versions plus a neutral π meson, while the spin 1/2 Ξs decay slowly to a Λ particle plus a π meson of appropriate charge. The fact that the Λ is already strange (strangeness -1) implies that for this decay to be slow, the Ξ particles must be doubly strange (strangeness -2). They are probably not strangeness 0 because they do not decay directly into protons and neutrons at all, but must take a decay path via the singly strange Λ. So now (historically speaking, in the 1950s and early 1960s when all these new particles, and many more besides, were being found) we were in a state where the simple elegance of a world constructed of just three particles - proton, neutron, and electron - had been expanded once more into a vast menagerie of other particles. Now we also had a slew of other baryons, with this "strangeness" property that had been invoked to explain otherwise inexplicable slow decay times. There was also a slew of different mesons which had also been discovered and that I have glossed over until now: π mesons in charges of -1, 0, and +1, neutral η mesons, K mesons in charges -1, 0, and +1, all of these having spin 0; then another group of mesons like these, but with spin 1: ρ mesons in three different charges, neutral ω and ψ mesons, and another whole set of K mesons. All together, there were well over a hundred different "elementary" particles. Gell-Mann's Eightfold Way classification of mesons and baryons. q is electric charge, s is strangeness. Based on Creative Commons Attribution-Share Alike images by Laura Scudder from Wikimedia Commons. The world had gone from the simplicity of the Ancient Greek four elements, to the complexity of over a hundred chemical elements, to the simplicity of just three sub-atomic particles, and now back to a complexity of over a hundred different sub-atomic particles. The process was a cycle of discovery and classification, adding new "elementary" substances to our pool of knowledge, and then once we had discovered enough of them, looking for patterns which might reveal and underlying structure built on something else. This was how Dmitri Mendeleev laid the foundations for unravelling the structure of the atom, by laying out the elements according to their properties in the periodic table. It was time to look for patterns again. In 1961, Murray Gell-Mann and, independently, Yuval Ne'eman came up with a classification system which seemed to impose a similar sort of order to the periodic table on to the collection of mesons and baryons. Gell-Mann called it the Eightfold Way, alluding to the Eightfold Path of Buddhism, because the arrangement included groupings of eight mesons and eight baryons into geometrical arrangements according to their properties. At the strangeness +1 edge were the K0 and K+ mesons, separated by electric charge (0 and +1 respectively). At the strangeness -1 edge were the anti-K0 and K- mesons, separated by electric charge (0 and -1 respectively). The other two corners were strangeness 0, with charge +1 and -1; here went the π+ and π- mesons respectively. In the middle was a spot with strangeness 0 and charge 0. The neutral π0 went here, but the neutral η meson also fit here, making a total of eight particles. At the strangeness +1 edge were the excited state K*0 and K*+ mesons, separated by electric charge (0 and +1 respectively). At the strangeness -1 edge were the excited state anti-K*0 and K*- mesons, separated by electric charge (0 and -1 respectively). The other two corners were strangeness 0, with charge +1 and -1; here went the ρ+ and ρ- mesons respectively. In the middle was a spot with strangeness 0 and charge 0. The neutral ρ0 went here, but the neutral ω meson also fit here, making a total of eight particles. At the strangeness 0 edge were the neutron and proton, separated by electric charge (0 and +1 respectively). At the strangeness -2 edge were the Ξ0 and Ξ- baryons, separated by electric charge (0 and -1 respectively). The other two corners were strangeness -1, with charge +1 and -1; here went the Σ+ and Σ- baryons respectively. In the middle was a spot with strangeness -1 and charge 0. The neutral Σ0 went here, but the neutral Λ baryon also fit here, making a total of eight particles. At the strangeness 0 edge were the Δ0 and Δ+, separated by electric charge (0 and +1 respectively). At the strangeness -2 edge were the excited state Ξ*0 and Ξ*- baryons, separated by electric charge (0 and -1 respectively). The other two corners were strangeness -1, with charge +1 and -1; here went the excited state Σ*+ and Σ*- baryons respectively. In the middle was a spot with strangeness -1 and charge 0. The neutral excited state Σ*0 went here... but in this case there was no other particle to occupy the same spot, like the Λ did in the spin 1/2 set. By analogy with the excited state versions of the K mesons, Σ baryons, and Ξ baryons, which mapped to their ground state versions at lower spin, it became clear that the Δ0 baryon was an excited state of the neutron, while the Δ+ baryon was an excited state of the proton. If you were paying attention, you will remember there are four Δ baryons of different charges: -1, 0, +1, and +2. The extra two Δ baryons, with charges -1 and +2, could also be placed on the graph, but they extended the corners of the hexagon, almost making it into a triangle (see the diagram). Here is where Gell-Mann made the leap that propelled him into the same intellectual territory as Dmitri Mendeleev 90 years earlier. By considering the structure of the patterns he had found, and the symmetries of his diagrams, he predicted that there should be an as yet undiscovered particle occupying the third corner of the triangle. He called it an Ω baryon, using the last letter of the Greek alphabet to indicate the last piece of the puzzle. From his diagram, he predicted it must have spin 3/2, electric charge -1, and strangeness -3. Also, given the masses of the Δ baryons (close to 1230 MeV), Σ* baryons (around 1380 MeV), and Ξ baryons (around 1530 MeV), increasing by 150 MeV with each step in strangeness, he predicted the Ω baryon should have a mass somewhere close to 1680 MeV. Particle track tracing of the first detection of the Ω baryon. Public domain image from Wikimedia Commons. In 1964, the particle accelerator research group at Brookhaven National Laboratory discovered a new particle in their experiments. It had spin 3/2, charge -1, strangeness -3, and a mass of 1672 MeV. It was Gell-Mann's predicted Ω baryon, and a stunning confirmation that there was something fundamental underlying the neatness of his Eightfold Way classification system. The up quark: charge +2/3, spin 1/2, strangeness 0, baryon number +1/3. The down quark: charge -1/3, spin 1/2, strangeness 0, baryon number +1/3. The strange quark: charge -1/3, spin 1/2, strangeness -1, baryon number +1/3. The anti-up quark: charge -2/3, spin 1/2, strangeness 0, baryon number -1/3. The anti-down quark: charge +1/3, spin 1/2, strangeness 0, baryon number -1/3. The anti-strange quark: charge +1/3, spin 1/2, strangeness +1, baryon number -1/3. To form baryons: Combine three quarks (total baryon number +1), or three anti-quarks (total baryon number -1). The spins can either be parallel, adding to give spin 3/2, or one of the spins can cancel another, leaving the remaining total spin of 1/2. In the spin 1/2 configuration, uud gives a total charge of +1, which makes a proton, while udd gives a total charge of 0, a neutron. Mixing in strange quarks allows the generation of the Σ, Λ, and Ξ baryons. Realigning the spins parallel to give total spin 3/2 generates the excited state versions. To form mesons: Combine one quark with one anti-quark. The total baryon number is 0. The spins can either cancel, giving spin 0, or align, giving spin 1. A quark combined with its own anti-quark cancels the charge, giving a neutral meson. A quark combined with a different anti-quark can give a charged meson: for example up and anti-down totals to charge +1, a π+ meson. 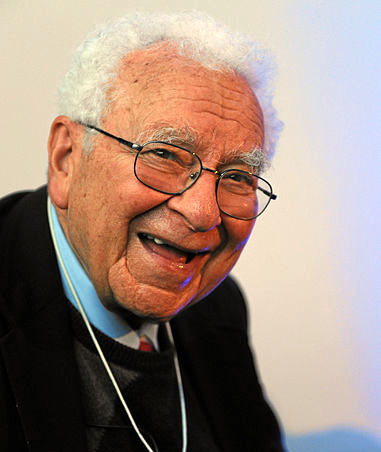 Murray Gell-Mann. Creative Commons Attribution-Share Alike image by Connormah from Wikimedia Commons. I won't go through all the details of how to make all the different baryons and mesons with just these few quarks - you may like to try for yourself, or you can look it up. There is one small question which you may have when you try this. To make the Δ- baryon, you form a ddd quark triplet, uuu gives the Δ++, and sss makes the Ω-. However all these quark triplets end up being spin 3/2. There is no spin 1/2 version of any of them. The corners of the triangle are missing in the spin 1/2 baryon diagram. This is because of the Pauli Exclusion Principle, which I have mentioned a couple of times briefly. In very simple terms, this quantum mechanical rule means that in a group of three identical particles of spin 1/2, the spins must align and add together, rather than two of them cancelling out. This is why there is no electric charge -1 or +2 companion of the neutron and proton. Gell-Mann's quark model was bold and sweeping in its scope and explanatory power. But was it true? In 1968, researchers at the Stanford Linear Accelerator were performing experiments to find out. In a method very similar to how Ernest Rutherford discovered the atomic nucleus, they were firing particles at protons to see if they had any internal structure. The scattering results of the experiment showed that a proton was not a simple sphere-like particle, but that it was more like an empty ball with very tiny point-like centres of concentrated mass and charge within it. The proton was not a single particle - it was made of something smaller. A year later, in 1969, Gell-Mann was awarded the Nobel Prize in Physics for his unravelling of the particle zoo, and the quark model which explained the vast abundance of mesons and baryons with a smaller number of more fundamental particles. This was a rather quick award by the Nobel Committee, but their boldness was borne out in subsequent experiments which have cemented the quark model's place in physics. There is more to say about the quark model (in particular, three additional types of quark which were discovered later), involving such whimsical terms as charm and colour, but I have run out of time this week. Another point to be aware of is that leptons, the class of particles that includes electrons and neutrinos, are not made of quarks. But leptons come in nowhere near as many types as the mesons and baryons. There are only six different leptons, as there are six different quarks, and the overall situation is still relatively simple compared to collections of hundreds of particles. From order (the Greek elements), to chaos (chemical elements), back to order (the periodic table and atomic structure), then to chaos again (the particle zoo), Gell-Mann and his contemporaries restored order once more to our understanding of the nature of matter. Title image is Creative Commons Attribution-NonCommercial-Share Alike by Tony Van Den Boomen. Last Modified: Sunday, 5 January 2014; 22:16:37 PST.